The classic shapes and wide openings make them as practical as they are beautiful. The airtight seal of the lid keeps contents wonderfully fresh in the refrigerator or on the counter. Permanent Glass Decals : TIC-TAC-TOE-420, LION, CONFIDENTIAL, GETSTONED, HERBS, RX. JARS are available in a wide range of sizes and designs, so you can always find the right tone to suit your style. 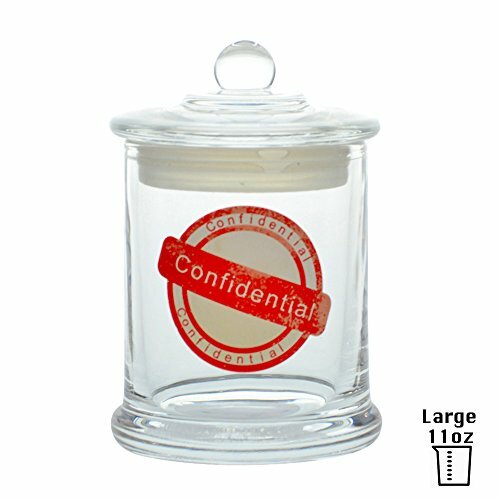 MADE to exacting standards in the USA, Vapors&Things stash jars are made from thick glass and come with a tough glass lid featuring a SILICONE seal which creates an airtight vacuum inside the jar when placed on top. This keeps the contents fresh, ready for use when you need them most. GREAT for storing medicine and herbs It's also great as a GIFT container for homemade delicacies. 6 different Decals: TIC-TAC-TOE-420, LION, CONFIDENTIAL, GETSTONED, HERBS,RX. If you have any questions about this product by Vapors & Things, contact us by completing and submitting the form below. If you are looking for a specif part number, please include it with your message.